However, they were fully cleared from accusations based on Article 149. Extortion of property, because they apparently did not force money out of mining company. 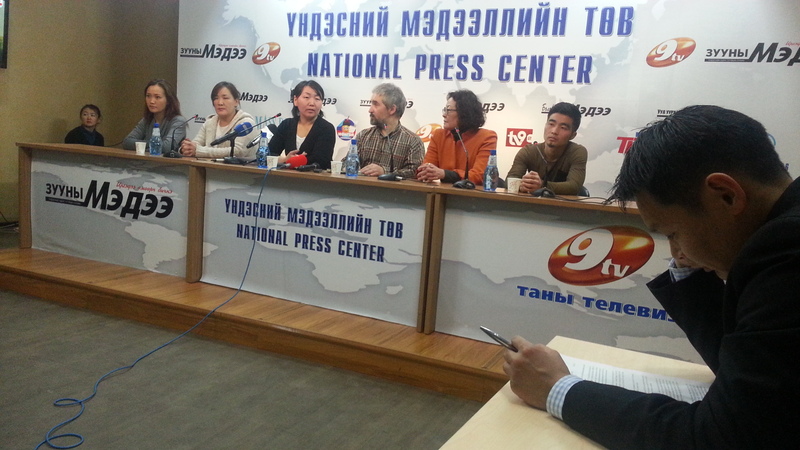 The RwB representatives have declared on the first press-conference on January 22 that the sentence is absolutely disproportional to the deeds of protesters, and soon we learned that lead experts in Mongolia share our concerns and are even more radical in their judgement than NGOs. Zuuny Medee Daily on January 24, presented an interview taken by By Ch. Ul-Oldokh from the prominent Academician Lawyer S. Narangerel regarding the 21 year and 6 months’ imprisonment sentence delivered by the court on the leader of “Fire nation “Ts. Munkhbayar and his team. Here we present translation of relevant parts done by Sukhgerel Dugersuren (OT Watch\RwB Mongolia). After the interview we provided text of relevant articles of the Criminal Code. – The longterm imprisonment sentence delivered by the court on for Ts, Munkhbayar and team has shocked the public. What do you think about this court decision? S. Narangerel-The court has delivered an inexplicably “inhumane” sentence in the opinion of right-mindedpeople in Ts. Mukhbayar’s case,which does not contain the elements of a grave crime against public security such as the crime of “banditry”. I will not hide that I think that the court which delivered this sentence is not court where right or wrong is weighed but political tool that carries out repression and stamp on acts. -Clause 177.2 of the Criminal Code which stipulates that subjects charged with a terrorist act under the clause shall be sentenced to 20-25 years of imprisonment. That is what the court has applied? S. Narangerel– I just said the court has applied this sentence in the Ts. Munhkbayar case when there is not element of a crime that is described as “banditry”. -Why do you think so, can you elaborate? S. Narangerel-Legislators defined the key element of “banditry” as direct or indirect act of forcing a public office or official to deliver or refrain from deliver a certain decision. The purpose of “the law with a long name” is to prevent land destruction, especially in headwaters and fragile areas, that will benefit the for profit interests of individuals. There is no way an attempt to stop an amendment that would make such a law weaker or derogate its implemention should be interpreted as a threat to society. This public interest demand is in fact in full conformity with the fundamental rights and interests of the Mongolian people. In addition to this the Criminal Code stipulates that the crime should not only contain an element of demanding a public office or official to deliver or refrain from a certain decision but also should include an element of use of force or threat to use force that creates fear and panic in society, which did not happen in this case. -You just mentioned use of force that creates fear in society did not happen in this case. Under the Criminal Code what is the definition of that use of force or threat to use force that creates fear in society? S. Narangerel-Use of force that kills large numbers of people, causes harm to their health, kidnap, arson that shocks society. Ts. Munkhbayar team has not caused any damage to life or health of anyone. They did not set fear in people by threatening to use or shooting at the public. The fall session of the parliament was not even disrupted by this event. There was no damage caused to other people’s property. That is why there was and is no fear in the society. On the contrary, the public has received this act of showing fire arms as a last means left in their attempts to protect the environment and natural resources, a fight of courage and will. The clause of the Criminal Code defined as “banditry” is essentially a terrorist act, a crime of terrorism. -You mentioned that there was no element of “terrorist act” in the Ts. Munkhabayr case. How should the appellate courts consider this case? S. Narangerel – Judges, prosecutors and investigators’ salaries are financed by taxes paid by citizens. The taxpayer tasked them to pacify the criminal and protect the innocent . They do not pay them to suppress the innocent and encourage the criminals. Therefore the court should abide by the fair justice rules and acquit the case based on the lack of elements of the alleged crime as stipulated in the Criminal Procedure Code. If it is too embarrassing for the court to acquit in such a manner, they could use Clause 16.2 of the Criminal Code stipulating that “An act or omission which, though formally containing signs of a criminal act specified by the Special part of the Criminal Code, poses no social danger by virtue of its little significance, shall not be qualified as crime”. -How do you define “insignificant”? S. Narangerel-It means that the intent was insignificant and caused no harm or damage. all did walk on the government compound with fire arms in his hands? S. Narangerel-One should look up the stipulations of “illegal possession of fire arms” in the Criminal Code or the Administrative Law and see if there is a provision for an administrative penalty. -What is the punishment for carrying fire arms illegally? S. Narangerel-The highest sentence is 5 years of imprisonment. –You are very critical of the new draft Law on Crime submitted by the Cabinet. The Munkbayar case seem to support the position that the letter of law, its definitions in Criminal Code need to be straightforward, clear and simple for everyone to understand and interpret? -I think that the fact that the court sentenced Ts. Munkhbayar team to 21 years and 6 months of imprisonment will trigger some thought within the society. The 2002 Criminal Code was not a good code. 6.2. A culprit shall be subjected to criminal liability once only. Code which are socially dangerous shall be recognized crimes. significance, shall not be recognized a crime. shall be punishable by imprisonment for a termof 11 to 15 years. shall be punishable by imprisonment for a termof 15 to 25 years or the death penalty. imprisonment for a termof up to 3 years. imprisonment for a termof more than 20 to 25 years or the death penalty. 31 to 50 amounts of minimumsalary or by incarceration for a termof 1 to 3 months. be punishable by imprisonment for a termof 2 to 5 years.